This article is about Donkey Kong Island in general. For the same island as a world after it was taken over by the Snowmads in Donkey Kong Country: Tropical Freeze, see Donkey Kong Island (world). Donkey Kong Island as seen in Donkey Kong Country Returns. Donkey Kong Island (referred to as Kongo Bongo Island in the Donkey Kong Country television series, and also known as Donkey Kong Country, DK Island or Kong Isle) is the home of Donkey Kong and the rest of the Kong Family. It is a key location from the Donkey Kong franchise. Much as the Mushroom Kingdom, the normally peaceful island has been invaded frequently, often due to King K. Rool and his Kremling Krew who once made their home on the nearby Crocodile Isle. The island was originally depicted as being shaped like Donkey Kong's head, complete with features such as ears and Donkey Kong's signature hair swirl. From Donkey Kong Country Returns onwards, however, the frozen mountaintops and the giant Donkey Kong head have been replaced by a huge volcano. The island itself is extremely large and has drastically different climates in various areas, some areas being jungle, frozen wasteland, and desert. There are several mysterious ruins on the island primarily resembling ancient South American architecture. Many of these ruins depict visages of Kremlings who are thought to have built some of these temples, and the world of Kremlantis. Despite this, Kong-themed architecture is extremely common, perhaps even more so, in other ruins found on the island. 1.1.3 Donkey Kong Country 3: Dixie Kong's Double Trouble! Donkey Kong Island is first seen in the game Donkey Kong Country, for the Super Nintendo Entertainment System. While Diddy Kong is guarding the Banana Hoard one night, a group of Kremlings led by a Klump (or a Krusha in the Game Boy Advance remake) appear and steal all of the bananas to menace the Kong Family. Setting off at once, Donkey frees Diddy from a barrel and begin a long quest to take back Donkey Kong's Golden Banana hoard from the thieves, leading them through the island's many areas. The journey sends them through jungles, caves, glaciers and a large factory operated by the Kremlings before the two heroes finally locate the source of the problem. Finding a ship docked in the waters near Donkey Kong Island, the duo boards the vessel and defeats King K. Rool, allowing them to take back the Banana Hoard while driving the Kremling Krew from the island. 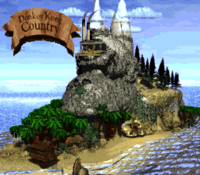 In the original renderMedia:DKC DK Island.jpeg the in-game map is based off of, there are a few locations that differ in position from the game itself, likely to make them easier to see in the game, or to adjust the order they are traveled to. Notably, Kremkroc Industries, Inc. is behind some trees in between Vine Valley and Gorilla Glacier in the render, but on top of the DK head's eyebrow ridges between Gorilla Glacier and Chimp Caverns in-game. Donkey Kong Island appears only sparingly in Donkey Kong Country 2: Diddy's Kong Quest. In the SNES version, it can be seen from Crocodile Isle in the distance, specifically while on the maps of Gangplank Galleon and K. Rool's Keep. These cameo appearances were removed in the Game Boy Advance version, as the maps are now viewed from a top-down perspective. However, the opening cinematic of the Game Boy Advance version takes place on a beach on Donkey Kong Island, where Donkey Kong retires to relax from the previous adventure before he is kidnapped and flown to Crocodile Isle by the Kremlings. Donkey Kong Island (left cliff) in Donkey Kong Country 3: Dixie Kong's Double Trouble! While Donkey Kong Island does not appear in Donkey Kong Country 3: Dixie Kong's Double Trouble!, it is mentioned in the instruction manual for the game, where it states Dixie Kong traveled down to the southern shores of the island and swam to the nearby Northern Kremisphere to search for Donkey Kong and Diddy Kong. Donkey Kong 64 featured a return of Kong Isle as the primary location of the game's levels, also featuring several different environments similar to its portrayal in previous games. 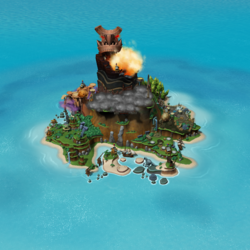 The island is revealed to be part of an archipelago consisting of smaller islands known collectively as DK Isles, several of which are accessible as a part of the story. At the beginning of the game which King K. Rool appears in a mechanized version of Crocodile Isle with a plan to destroy the homeland of the Kongs. Tired of his constant defeats at the hands of the Kong Family, King K. Rool pilots his metal monstrosity into the archipelago with his new secret weapon, a giant, island-destroying laser cannon named the Blast-o-Matic. He plans to use the device immediately, but a malfunction caused by his incompetent underlings short-circuits his plans and delays the machine's activation. In a bid to distract Donkey Kong while they repair the Blast-o-Matic, the Kremlings invade the island in force and kidnap Donkey Kong's friends, stealing his Golden Bananas and blocking off several locations on the island in order to further impede the hero's progress. After another quest, Donkey Kong frees his friends and reclaims the Banana Hoard. With the help of the Blast-o-Matic's inventor, a crafty weasel named Snide, the Kong Family deactivates the doomsday weapon and saves their home from destruction. It is worth noting that the island was smaller in size in this game than in previous installments, although this is likely due to technical issues, such as making it easier to roam the island. The vast locations accessible through portals on the island are different areas of Donkey Kong Island, and what is seen on the surface is not the entire landmass. Since the events of this game, Donkey Kong Island has been missing a boulder in its right ear, as it had been blown off by K. Lumsy. The island makes yet another appearance in Donkey Kong Country Returns and Donkey Kong Country Returns 3D, once again acting as the main location. In its most recent appearance, the Kong Family is featured much less prominently as the main population of the island, with only DK, Diddy, and Cranky making full appearances in the game. Several new creatures are also shown to make their home on Donkey Kong Island in this game which were previously unseen in the series. When seen, the island is also under attack by a new antagonist group known as the Tiki Tak Tribe, who attach themselves to other creatures to take control of their hosts. Much like the Kremling Krew before them, these new enemies are eventually defeated by Kong Family and removed from the island. Strangely, the mountains of Donkey Kong Island do not resemble Donkey Kong's head in this game, but are instead ordinary mountains. However, the worlds and their locations are mostly the same as in Donkey Kong Country. Donkey Kong Island appears in the fifth installment of the Donkey Kong Country series: Donkey Kong Country: Tropical Freeze. The game features seven islands, which serve as the game's worlds. Donkey Kong Island is the sixth and final "main" island of the game (the seventh island, Secret Seclusion, is a bonus world). During the game's intro, Donkey Kong, Diddy Kong, Dixie Kong, and Cranky Kong are celebrating Donkey Kong's birthday. The view then moves far from the island to a large ship, which is being controlled by the Snowmads. A Pointy Tuck watches over the island, locates DK's Tree House, and gives the info to Lord Fredrik; the leader of the Snowmads. Upon the leader nodding their approval, several Pointy Tucks blow horns, as six more carry a large white horn covered with mist. Lord Fredrik laughs as he blows the horn, creating a large amount of wind, as well as a strange ice dragon. The ice dragon then flies toward the island, turning the sea into ice. After this, the Kongs are blown away by the intense winds, and the large ship stations itself where the Volcano from Donkey Kong Country Returns used to be. Finally, the Snowmads seize the island for their own, turning it into a frosty area with continuous snowfall. The Kongs eventually get back to Donkey Kong Island and defeat Lord Fredrik at the top. After this, he falls into one of the ships around the island, and the Snowmads leave. Using the horn that the Snowmads left behind, Donkey Kong blows into it, melting all of the snow and ice, and returning Donkey Kong Island back to normal. Donkey Kong Island is also where the events of DK: King of Swing and the Donkey Konga trilogy take place. The jungle portion of the island appears as a setting in several Mario sports games, such as Mario Golf: Toadstool Tour, Mario Power Tennis, Mario Superstar Baseball, as well as Mario Strikers, and in the Super Smash Bros. series, where it is parted into four playable stages: Kongo Jungle, Kongo Falls, Jungle Japes, and Jungle Hijinxs. In Super Smash Bros. Ultimate, a view of the entire DK Island appears during K. Rool's Final Smash, in which he blows it up with the Blast-o-Matic. In this game, it appears similar to the Donkey Kong Country incarnation in design (though with DK's Tree House in Vine Valley, rather than Kongo Jungle) and the Donkey Kong 64 design in size, and is notably the first time in several games that it is depicted as resembling Donkey Kong's head. Additionally, a recreation of the original Kongo Jungle world map from Donkey Kong Country appears as a subarea in the game's Adventure mode, World of Light, under the name "DK Island." In several episodes of Captain N: The Game Master, a world named "Kongo Land" was mentioned as the homeworld of Donkey Kong, though it is unknown if the two worlds are related. Donkey Kong Island was also the main setting of the Donkey Kong Country television series. On the show, Donkey Kong Island was renamed "Kongo Bongo Island" (or just simply "Kongo Bongo") and the island was also shaped differently, similar in appearance to a banana rather than DK's head. Like in the games, Kongo Bongo Island was home to the Kongs, among other creatures. Donkey Kong Island is the main setting of the Donkey Kong Country series of children's novels, published by Troll Communications. Both the Donkey Kong Country novel and Donkey Kong Country: Rumble in the Jungle have the Kongs passing through Tree Top Town at the edge of the jungle, before reaching a snowy mountain location. In Donkey Kong Country, the Kongs continue through a circuit of underground mines before reaching the Kremlings' factory, whereas in Rumble in the Jungle, the Kongs travel through the caves of a mountain in order to reach the factory in Big Ape City, which appears to be located near the center of Donkey Kong Island. In Donkey Kong Country: Rescue on Crocodile Isle, Diddy Kong and Dixie Kong borrow a sailing ship at the docks of Donkey Kong Island, before arriving at Crocodile Isle after a full day of sailing. The denizens of Donkey Kong Island usually live peacefully together. While there does not appear to be an official government in place, Donkey Kong acts as the leader of the Kong Family, and the clan typically turns to him for leadership. Despite no longer having the strength to acts as the island's protector, Cranky Kong appears to have retained his role as patriarch of the family, and is often seen giving orders to the others while advising the younger generation during difficult times. In comparison, the events of the animated television series indicate that Donkey Kong is slated to be future ruler of the island, implying that in the show, he has not yet earned the title. Donkey Kong Island is home to a number of different creatures, the most notable being the Kongs, a group of monkeys who make up the primary cast of the Donkey Kong series. In addition to the apes, many other animals on the island are known to be intelligent, with most possessing the ability to speak. Several species such as the Gnawties, Zingers, and Neckies are affiliated with the Kremling Krew, one of the Kongs' enemies. The Kremlings are also a prevalent race inhabiting the island, having established an industrial plant known as Kremkroc Industries, Inc., in addition to several outposts. The ancient temples found in Angry Aztec and several other locations are also heavily occupied by the Kremlings, although whether or not they built them is never specifically mentioned. As of Donkey Kong Country Returns, the island's fauna appears to have completely changed along with its geography. It is also shown to have more variety as well, with groups of animals living in select habitats. The Jungle is mainly inhabited by bird species such as Awks and Rawks, as well as Frogoons, while the Beach is occupied by crustaceans like Snaps and Pinchlys. The Cave hosts a population of Squeeklys and is also home to a large demographic of sapient Mole Miners. The Forest commonly houses spider-based creatures, such as Skittlers and Munchers, but Cling Cobras are also present here. Subjects living closer to the summit of the island have a less organic appearance. The Cliff portion is populated by live dinosaur skeletons, the Factory houses various types of robots, and the Volcano typically contains fire-based creatures, like Char-Chars and leaping flames. Fossils inlaid within the rocks in the Cliff area hint at previous inhabitants of the island, consisting of enormous trilobite lookalikes, gastropods, placoderm fish, and eurypterids. These suggest that Donkey Kong Island was once underwater from the Cliff beneath. After the Kremlings' invasion and their supposed retreat, several other groups have taken over Donkey Kong Island, altering the island. During the events of Donkey Kong Country Returns and Donkey Kong Country: Tropical Freeze, the Tiki Tak Tribe and the Snowmads respectively have represented significant parts of the population. The Kongs eventually exiled both the Tiki Tak Tribe and the Snowmads from the island. In Donkey Kong Country Returns, if one were to move from an earlier world to a later world using the map, Donkey Kong will be positioned at the first level of the later world. However, if one were to move from a later world to an earlier world DK will be position at the Boss Level of the earlier world. The only world that breaks this rule is the Jungle, being the first world it does not have an earlier world. In order for DK to be placed at the first Jungle level, he will have to move from the final world (Golden Temple) to the Jungle. ↑ Donkey Kong Country instruction booklet; "Donkey Kong Island" on page 4; "Donkey Kong Country" on pages 12, 13, 16, 20-24, 26, 27, 30. ↑ Teitelbaum, M. 1997. Donkey Kong Country: Rescue on Crocodile Isle, pg 7. "The Kremlings were a race of nasty lizardlike creatures that lived in Donkey Kong Country." ↑ "Usually one of the most restful and laid-back places imaginable, Donkey Kong Country had become a hive of activity in recent days." - Donkey Kong Land III instruction booklet, page 2. ↑ Donkey Kong Country 3: Dixie Kong's Double Trouble instruction booklet, pages 4, 5, 19. ↑ Donkey Kong Land III instruction booklet, page 23. ↑ Donkey Kong 64 instruction booklet, pages 5, 10, 29. ↑ Diddy's words: "Gone exploring the islands with DK. Back tomorrow!" - Donkey Kong Country 3: Dixie Kong's Double Trouble! This page was last edited on February 25, 2019, at 17:10.